A letter of intent (LOI) indicates two individual's agreement to engage in an activity or otherwise do something that they are not legally obligated to do. This type of agreement can be used in business transactions. These agreements, however, are not legally binding in most states. As such, they do not constitute a contract and cannot be the basis for an award of damages based on a breach of contract. To be legally binding, the parties must enter into a contract regarding the actual event. For example, an LOI agreeing to sell a business is not legally binding, but a contract for sale of a business entered in to after execution of an LOI is binding. Nevertheless, legal disputes about LOIs occur. These disputes are normally litigated before courts of law having jurisdiction over the event, and not jurisdiction over the parties. Depending on the type of agreement and activities engaged in by the parties toward fulfillment of their portion of the LOI, a court may grant damages to either party. These damages are "reliance damages" and are normally awarded for one party's reliance on the LOI and other party's promise. The sample LOI given in this article can be completed to cover an agreement for many types of business or non-business transactions or events, for example, a promise to enter into a sale of a business, make a loan, or investigate franchise opportunities. The LOI included in this article is for sample purposes; always seek legal advice before entering into any legal agreement. If you need help downloading the sample LOI, check out these helpful tips. Download a sample letter of intent. 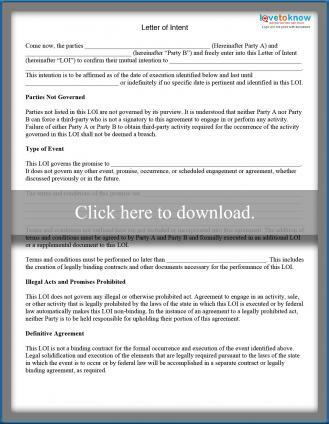 Since most LOIs involve two parties, this section identifies the two main parties to this agreement. It also identifies the event to which the parties agree to engage in and the date upon which the LOI expires. Identification of the event in this section can be general because more information about it is provided in a subsequent section. This section does not require providing any information. It is a statement showing that the parties to the LOI understand that they cannot hold the other party responsible for a third-party's failure to perform something necessary for the occurrence of the event agreed to between the parties. This section exists because a court of law will not uphold any claim that a party to an LOI failed to force a third-party to act or not act for the purpose of fulfilling the LOI. In this section, the parties to the agreement should provide information about the event being promised to engage in and the terms and conditions regarding that event. Being as specific as possible will help avoid disputes about what was intended or required to occur for fulfillment of the LOI. Inserting a date by which these terms and conditions must occur helps the parties keep track of the status of progress for the event. A person cannot be forced to engage in an illegal act, regardless of having entered into an agreement to do so. This section identifies the parties' recognition of this and restates that, if this occurs, neither party can be held legally responsible for failing to perform any activities stated in the LOI. This portion of the sample LOI indicates that the parties understand that the LOI is not binding and that they must actually enter into a contract governing the event to have a binding contractual agreement. For example, an LOI to sell a business is not binding until a contract for sale is executed. This paragraph states that the parties may be liable for reliance damages for not performing part of the agreement. However, these damages must be awarded by a court of law. Here, the parties recognize that this agreement is not a contract and, as such, cannot be the basis for the award of breach of contract damages. This section reinforces the parties' understanding that the agreement does not constitute a basis for the automatic award of damages if either fails to perform. It further affirms the parties' recognition that the agreement is not a contract and that reliance damages must be awarded by a court. Be as specific as possible when completing the sections of this sample LOI that identify the type of event over which the LOI is to govern. As always, seek legal advice before entering into any legal agreement.